Scotland will "go all out" for Euro 2020 qualification, says manager Alex McLeish. McLeish's side, who can also reach the finals via the Nations League play-offs, start their Group I campaign with away matches against Kazakhstan and San Marino next month. Belgium, Cyprus and Russia are also in the Scots' group. 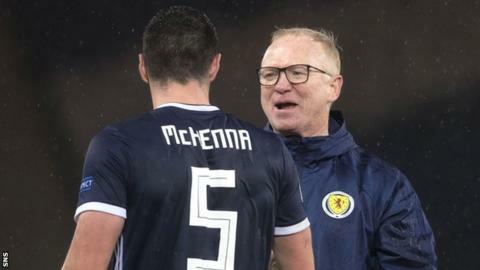 "There was a fantastic outcome to the group stage in the Nations League," McLeish told BBC Scotland's The Nine. "So, we would get a second bite at the cherry if we don't qualify through the Euro 2020 group stages but we are going all out to qualify, possibly along with Belgium or Russia." McLeish recently spoke up in support of Scotland's referees following a number of criticisms this season and calls for video assistant referees to be introduced in the Premiership. The former Rangers and Hibernian boss said of VAR: "It's coming. We have to embrace it. "Sometimes it's still subjective. It's costly and a lot of clubs can't afford it." Scotland rugby head coach Gregor Townsend appeared with McLeish on The Nine. He believes the use of television match officials in rugby does not preclude the potential for continued controversies. "It doesn't take the opinions away," he said. "Even the video referee won't see everything in our sport too."